Taipei, Taiwan, July 20, 2018 (TEIA)– Taichung Port is going to extend its current outer breakwaters further into the ocean to accommodate a Liquefied Natural Gas (LNG) import terminal proposed by Taiwan Power Company and Port of Taichung, Taiwan International Ports Corporation, Ltd. . The proposed reclamation ground reaches 50 hectare in area and may have significant impacts to the environment, which include intercepting Taiwanese Humpback Dolphin (Sousa chinensis taiwanensis) migratory corridor. Shun-Kuei Chan (詹順貴), Deputy Minister of Taiwan Environmental Protection Administration, worries that heated debates over this issue are on the way. A compulsory Phase Ⅱ Environmental Impact Assessment for this expansion plan passed during the 334th meeting of Taiwan Environmental Protection Administration's Environmental Impact Assessment Review Committee (hereafter called Review Committee) on July 20th, 2018. The standard operating procedure of fulfilling a Phase Ⅱ Environmental Impact Assessment, as regulated by Taiwan's "Environmental Impact Assessment Act", comprises: Holding public explanation meeting; Defining the scope of assessment; Drafting environmental impact assessment report; Conducting on-site inspection; Calling for public hearings; and then Completing environmental impact statement review. Taichung Port is going to extend its current outer breakwaters further into the ocean to accommodate a Liquefied Natural Gas import terminal. It may intercept Taiwanese humpback dolphin migratory corridor. Excerpted from the submitted environmental impact assessment report. Taichung Port, situated between Dajia and Dadu River Estuary, is located inside the preannounced “Taiwanese Humpback Dolphin Major Wildlife Habitat.” It is also within the Taiwanese humpback dolphin migratory corridor. Jeng Ming-Shiou(鄭明修), a member of the Review Committee, comments that whether the dolphins in the vicinities are able to “make a turn to avoid obstacles or not” would be a critical issue. Having obstacles, such as gigantic underwater structure or deeper water depth, some dolphins may swim around these obstacles but some may just make a U-turn. The change of migratory behavior may lead to a segregation of the Taiwanese humpback dolphin's already small population. A segregated population may lead to loss of genetic diversity and then ultimately extinction of the species. Jeng reminds that conducting ethological study on Taiwanese humpback dolphin is critical to the species' survival. 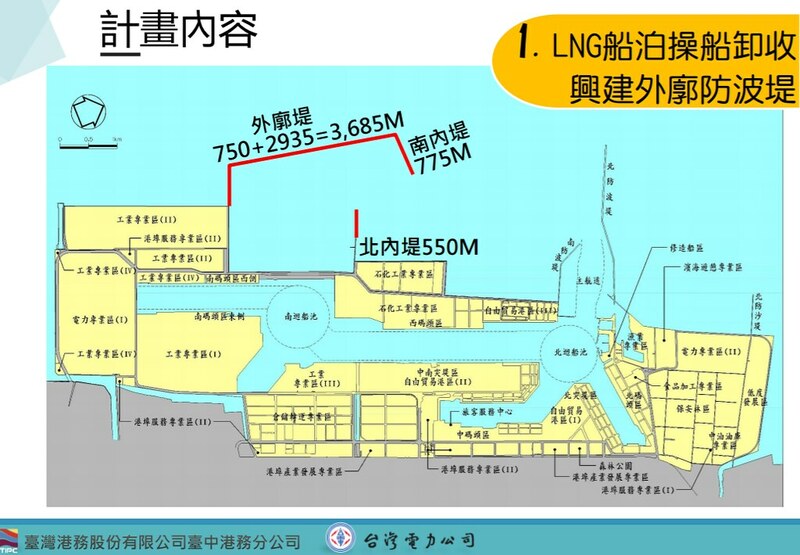 The LNG import terminal plan is a joint development between Taiwan Power Company and Port of Taichung, Taiwan International Ports Corporation, Ltd.. In the materials submitted to the Review Committee, the developers promised to monitor and record underwater acoustics, food sources, as well as at sea survey and on-land observation for the Taiwanese humpback dolphin. To carry out the work, the going-to-be recruited experts are, Chen Chi-Fang (陳其芳) for underwater acoustics; Shao Kwang-Tsao (邵廣昭) for food sources; plus Chou Lien-Siang (周蓮香) and Lee Pei-Yi (李佩沂) for at sea survey and on-land observation. Mitigation, prevention, and protection plans for intercepting the Taiwanese humpback dolphin migratory corridor will be provided when its Phase II Environmental Impact Assessments initiates. Members of the Review Committee put a special request to the developers prioritizing how to avoid disturbing local wildlifes, such as Taiwanese humpback dolphin, in Taichung Port and its vancinities. Specific action plans or alternative resolutions for underwater noisy, water quality, water temperature, the dolphin's food sources, and intercepted wildlife habitat mitigation should be provided. Additionally, local aquaculture, terrestrial ecology, bird species, and underwater cultural heritage should be incorporated in the Phase Ⅱ Environmental Impact Assessment.